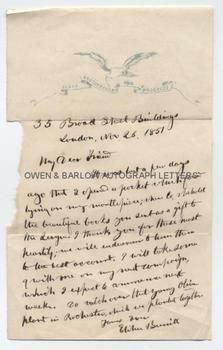 ELIHU BURRITT autograph Letter Signed. American philanthropist and social activist. Known as "The Learned Blacksmith". ALS. 1p. On his 'Peace, Brotherhood and Progress' letter-headed paper. 35 Broad Street Buildings, London. November 26th 1851. To "My Dear Friend". "It was but a few days ago that I opened a packet found lying on my mantlepiece [sic]; when lo and behold the beautiful books you sent as a gift to the League. I thank you for these most heartily; we will endeavour to use them to the best account. I will take some with me on my next campaign, which I expect to commence next week. Do watch over that young Olive plant in Rochester, which we planted together." 8vo. Approx 7.5 x 4.5 inches. Loss at left margin (not touching any part of the text), else fine. Elihu Burritt was a tireless campaigner for an end to slavery, temperance and world peace. He was much admired by Abraham Lincoln who appointed Burritt as American Consul to Birmingham, England. Elihu Burritt founded the League of Universal Brotherhood and the Peace of Nations Society. He organised the extraordinary 'International Congress of the Friends of Peace', which was the forerunner of the United Nations Organisation. His tours of Britain included a campaign in Rochester, Kent, the home of his friend Frederick Wheeler (a Quaker peace activist who later accompanied Elihu Burritt to the Frankfurt Peace Congress). Wheeler had been offered the secretaryship of the Society in 1848 but had refused it. Possibly, this letter is to Wheeler. The 'Olive plant' referred to in the letter is probably a referrence to Burritt's periodical contributions, which were known as 'Olive Leaves' and were addressed to local populations through regional newspapers.